THANK YOU to everyone that came out in droves to the Modern Economy sale last Saturday. Seriously, I was blown away by the turnout and the line to get in. Amazing! 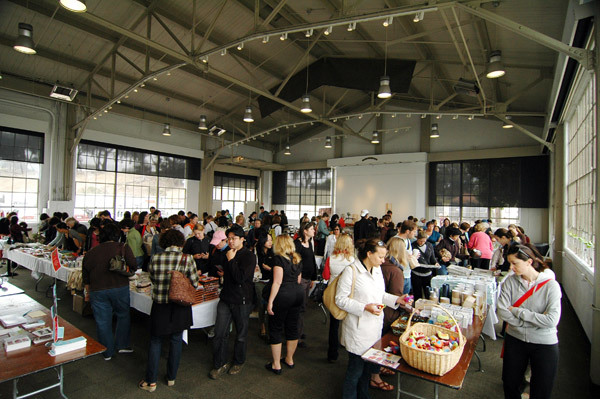 Thank you as well to the SF Chronicle, DailyCandy, Design*Sponge, Oh Joy!, SFgirlbythebay, SF Apartment Therapy, SFist, and all the other blogs out there for pre-show press that made the sale a big ole success! Just so you know, I'm trying to squeeze in the 2nd Annual Los Angeles Modern Economy sale before 2007 ends. I'll be in LA scouting locations in a couple weeks. I plan on bringing much more merchandise and adding a whole new set of coveted designers to the line up. I will start posting the new designers as soon as I get confirmation from them. So sit tight for details to come! I'm bummed I didn't have the cash to spare for this event, but I'll be at the next one, no doubt about it!